Recently I looked for how it was possible to detect a classical stack overflow at runtime. It's a really great subject with lot of interesting problematics - That's what we will see in this short post. The stack and heap overflow are in the same vulnerability family - With the same theory. However, if you want use pattern matching to detect one of these vulnerabilites, the methodology will be really different. The heap overflow detection is easier than the stack overflow detection. In the next chapters, we will talk about both approaches to show you that the stack overflow detection at runtime is a bit complicated but that's also the most interesting part. Basically, if you monitor your allocator, you can determine the base address and the size of your allocation areas. Then, if you check all STORE and LOAD accesses in memory, you can determine which one is outside your area. 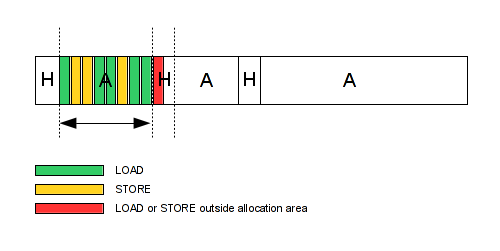 The following diagram, represents the memory and the STORE/LOAD access, the red one is the invalid access which is easy to detect at runtime via the STORE/LOAD analysis. Let's see with a simple C code. The following code allocates two buffers with the same size and fills these areas in excess of 1 byte (Off-by-One). Here, we can supervise all calls to the malloc function and save the base address and the size of our buffer in a std::list. Then, when a STORE or LOAD occurs, we just need to check if the destination address is in our list. If this is outside our area, we have probably an overflow. Same things with a C++ example. A private buffer is filled via a public method. And we have a similar result than the first one. As you can see, detecting an heap overflow at runtime is really straightforward - In a simple case. Maybe you will ask you "Why does he talk about the heap overflow detection if it's straightforward to implement it". You are right, this chapter has just been written to show you that the methodology to detect a heap and stack overflow is really different. Now let's see what it's possible to do about the stack overflow detection. We can't rely on the previous method due to several issues. 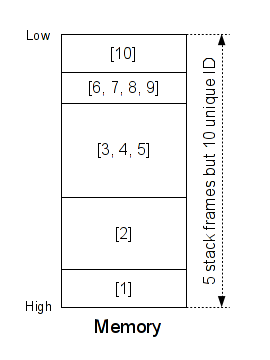 First, if we consider that the memory area is a stack frame, we have not one but several variables in the same area. The main problem is to detect the overflow between these variables. Little example with the following code. This above code allocates three variables in the same stack frame. Then, we have a loop which fills the 'a' variable in excess of 1 byte (Off-by-one). Below the result of this operation. As you can see the 'a' variable is filled and the 'c' variable is corrupted. Maybe you will ask you, "Why 'c' not 'b'?". That depend on your compiler, here, my compiler sets the variable 'c' after the 'a' variable. But don't worry the methodology is still the same. Below our memory representation. 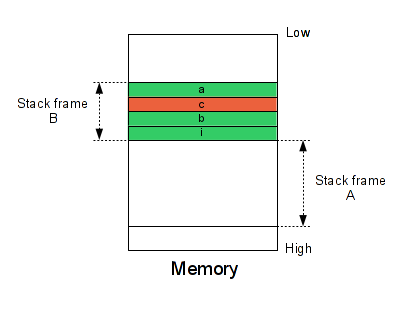 Know how many variables are instantiated in the stack frame. 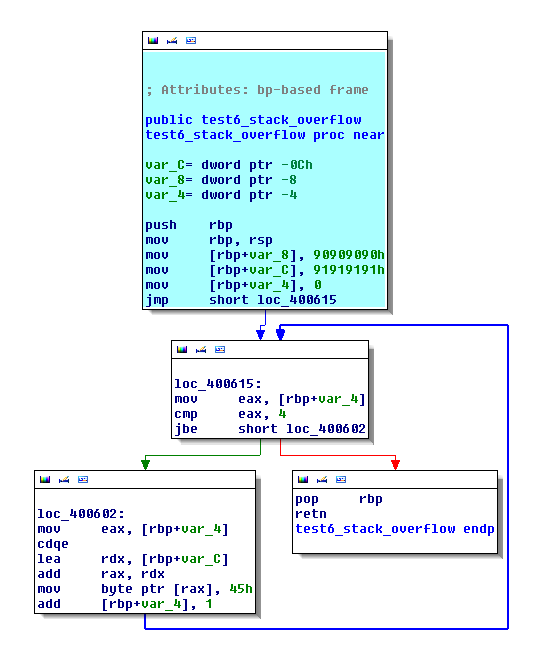 Detect the loops which contain a STORE instruction to our stack frame. Analyze this STORE to detect a potential overflow. To be honest, the steps 1 and 3 are really straightforward. The real difficulties are for the step 2 and 4. As you can see, at the instant T we have 5 stack frames but 10 unique ID. You can consider this assignation like the SSA form - To each new stack frame, we assign a new unique ID. Now, we need to find how many variables are instantiated in a stack frame. This step is a little bit complicated but very interesting. As you already know, the variables are generally initialised just after the prologue and are in the first basic block in a function. For our first example, imagine the following code. The IDA view looks like that. In a nutshell, we don't add a new element in our std::list stack_var if the destination address in the stack frame has already been initialised. This step is a little bit complicated... At this time, I'm still working still on it and it is far from being over. We can't use the pattern matching to know the size of a specific variable. Each compiler and each context will generate a different ASM code for the same C code. The stack frame management will be the same. The best way (I think), is to analyze the behavior of each variables (Value Set Analysis). In some specific case, we don't need to apply the VSA. Example with this following code. In this case, we can rely on the value of RSP/RBP and the address of variables to know their sizes. Maybe I will write another post about this part because we can say lot of interesting things. To detect the loops, I've chosen to count the number of instruction executed and analyze the trace. It's probably not the best solution but for simple tests this is enough. As you can see, we can easier show the loop. 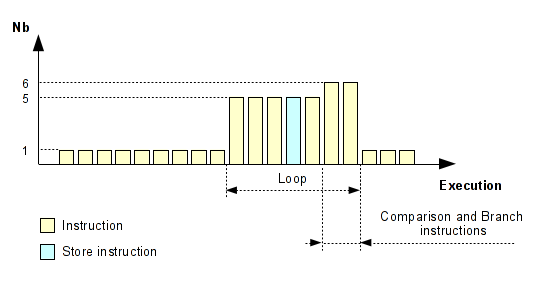 Generally a loop ends with a conditional jump. However, this method doesn't work if the loop was taken only one time but this case does not interest us. 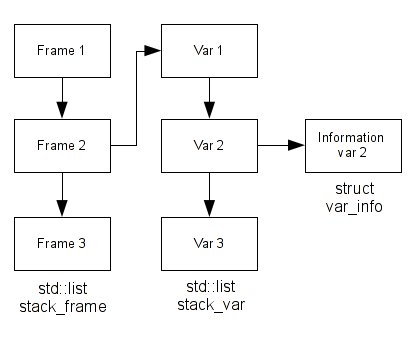 Here, we need to find the loops which contain a STORE instruction on our stack frame. This memset tricks is often used. This is clearly an overflow, but an overflow controlled :). Now, let's see what I can catch with this method. 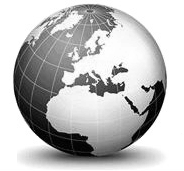 See the following test code. As you can see, I also added the use-after-free detection, this method is written in a previous post. This short post tried to show you the different ways to detect the stack and heap overflow and as you can see the methodology is really different. I know that the approach to the stack overflow detection is not the best and that it is not reliable but it was interesting to study. Now if I need to detect a stack overflow in a real research project, I will not use this approach. Maybe to work directly on the intermediate representation will be more easier - Like memcheck on Valgrind. The most interesting part was to the stack frame analysis, how many variables were instantiated and their sizes. I will not release my Pin tool because it's clearly not a serious project and my tool does not deserve to be published. However, if you are really interested in it, I can send it by email. Edit 2014-01-21: Since this blog post has been released, I received a lot of emails asking me if I could send or publish my sources. I have sent it to every person who asked me, but I won't keep the sources indefinitely on my laptop, that's why finally I decided to release them. You may ask why I didn't release them? I consider them really not reliable, they are really specific to my examples. You've been warned that you may have to modify a lot the sources if you want to adapt them to your project :-). Anyway I hope these sources will help some people :-).